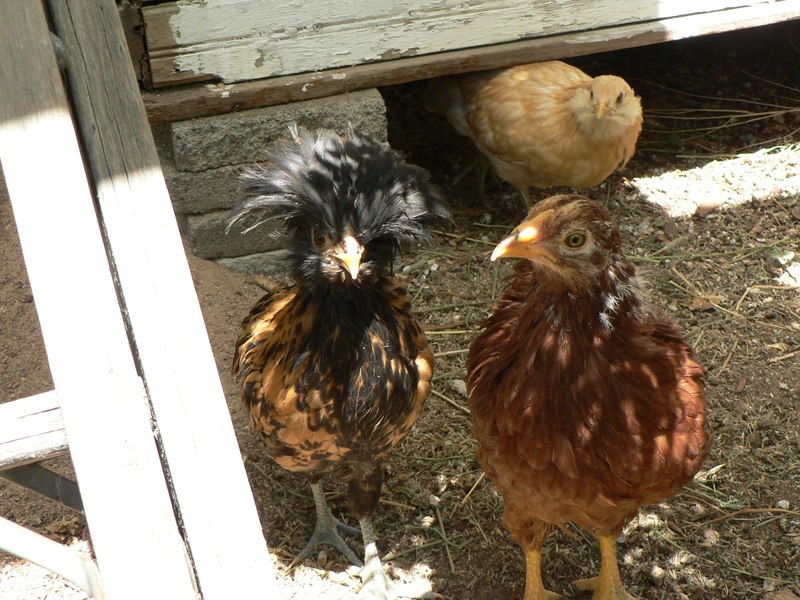 Three of the girls (Popcorn, Tipsy and Sesame) checking me out on a sunnier day. I’m probably too sentimental to have chickens as pets. These are barnyard birds after all (or at best backyard), apparently with little need for extraneous things like light, warmth or comfort. Except of course that they appear to crave those things, if you really watch them. Which is why I turned the light back on. I was so proud of myself, and my little girls (who just turned 8 weeks old), when I finally stopped plugging in their lightbulb this week and let them find their way into their house and to safety on their own in the dark. They’d been getting themselves in there very predictably the last week or two, and all I had to do was go out and shut the door; but whenever I then also tried to unplug their light for the night, they’d scream bloody murder, so I always just plugged it back in and figured I’d wean them off it slowly. I gradually went from a 100-watt bulb, to 40 watts, to 25. Still, I plugged it in around dusk every day because I thought they needed it to “lure” them into their house (which initially they did, actually; one night, when I wasn’t home before dark to plug it in, I found them in a pile outside by the gate – but that was in their first 3 nights outside and they clearly now know where home is). And after that, of course, I couldn’t unplug it again without setting off a terrible screeching. Which is probably not the way to endear your odd choice of pets to the neighbors, if I had to guess. Anyway, last weekend I was discussing this dilemma with a more experienced chicken keeper and she just looked at me and said “Why are you unplugging the light? Just don’t turn it on in the first place!” Well duh. I guess I just didn’t spend much time thinking THAT one through; it seems pretty obvious now. So that’s what I did. They were on their own at dusk, no guiding light to lead them to their doorway. Lo and behold, they quickly (in 3 nights) graduated from being piled just inside the coop door – with their heads hanging out over the threshhold in the dark – to getting all the way inside and sleeping in the corners, to actually roosting on their pole tonight. Except tonight I turned the light on. It was raining cats and dogs. We just got through breaking all previous records (set way back in 1906 or something like that) for longest heat wave – 23 days straight in the upper 90s and 100s. And today the skies opened up and it has been raining, then pouring biblically, then raining. Everything is soaked. The new ‘rain garden’ that Tomas and I built in front of the house next to a drain pipe is a giant lake. The vegetables are drooping drastically and some plants are just flat. During a drippy interlude, the chickens were out and about, and I was visiting them just to see how they handle the rain. Their whole coop, the plants, the air, the ground, all of it was just so damp and chilly that I felt terrible for them. Who wants to go to bed in the damp and cold and dark? Not me! I HATE being cold. Damp is even worse, and both is just awful. I thought it would be nice to plug in their lamp for a bit to sort of warm up their house and maybe even create a little area of drier, comfier indoor air to hang out in, instead of a dank, cold, poo-smelling shack. So I did, and went inside to do other things. Well, before I knew it it was dark… so now they are roosting comfortably in their LIT house again, since of course I want to bet that pulling the plug on them at this hour would cause a ruckus. Maybe I can just alternate for another couple weeks – give them light and warmth on wet, chillier nights and leave them to their own devices on the more typical summer evenings. They are only 8 weeks old, after all. Babies, really.